One quirky thing is that we have to put the documentation inside the function. 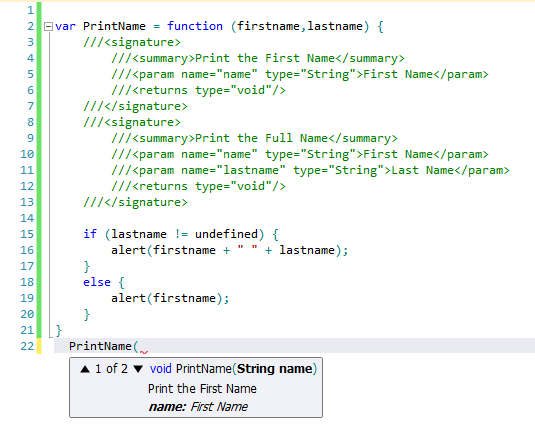 The <signature> element describes the documentation for one implementation of the function. The <summary> element describes the description of that implementation. The <param> element describes the details about one parameter of the function. The <returns> describes the type of the value which the function returns. And as you can see from the following image, the Intellisense does indeed pick it up and display the documentation accordingly. I would like to quote Jeff Atwood here "if your feel your code is too complex to understand without comments, your code is probably just bad." (http://www.codinghorror.com/blog/2008/07/coding-without-comments.html). Besides, the above has some serious issues. There is no static typing in JS so if your comments say that firstName is of type string then that is wrong. firstName could be of any type. In JS, it does not matter how many parameters you pass to a function, if the name of the function is correct and it can be found on the execution context chain, the function would be executed no matter if not all the parameters are provided. There is no easy way to provide a standard way of commenting a dynamic language like JS. Better option - Let your code speak.